You turn the rough, yellow-orange stone through your fingers. It glitters prettily in the light. Is it a piece of amber? No, it’s a Brazilian citrine! Often confused for other jewels, learn how to identify citrine and tell it apart from similar gems such as amber or golden beryl. A member of the quartz family, Brazilian citrine is famous for its breathtaking range of hues that capture the warm glow of autumn. Introduced by the Greeks during the Hellenistic period, this beautiful gemstone is also known as a "merchant's stone" due to the practice of placing it near the cash register in shops. Is Brazilian citrine valuable? The value of colored stones is typically determined by a combination of its color, clarity, cut, and carat weight. This is no different when determining what citrine is worth. These guidelines will help you choose citrine stones for your collection. Brazilian citrine occurs in a wide range of colors, from pale yellow to brownish yellow. It beautifully captures the warm glow of autumn. 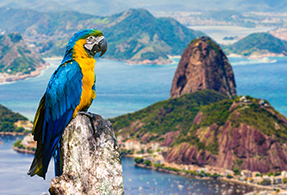 Specimens from Brazil favor a fine variety of colors on the market, including light lemon yellow, golden yellow, yellow-brown, mandarin orange, and burnt orange. In these shades, you’ll find many variations, with several scarce types that only make up a small percentage of the stone’s potential. When choosing citrine, the stone’s color is most important. The gemstone favors a deep saturation of color. 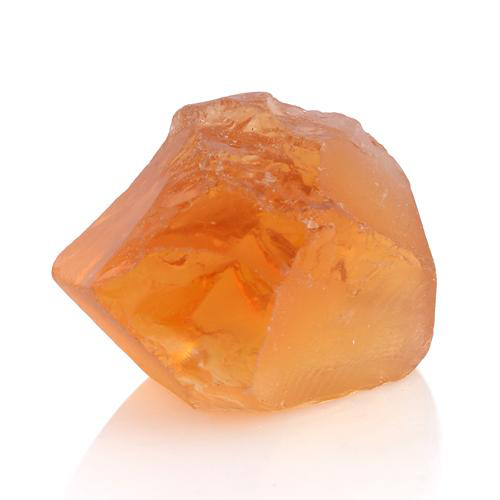 Brazilian citrine is highly sought after and commands a higher price in today’s market. 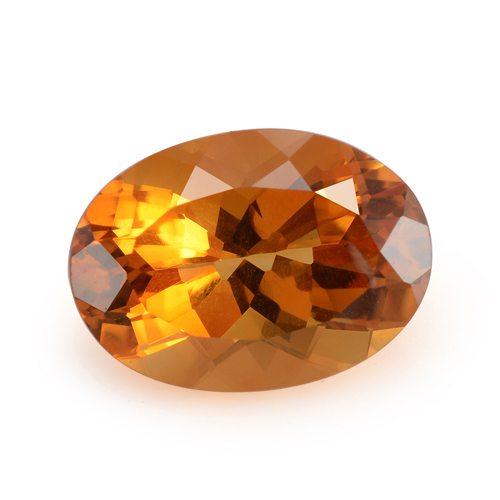 Brazilian citrine belongs to Type I and II category of the GIA clarity grading system. Type I stones are almost always eye-clean, and any inclusions require standard 10x magnification to see. Type II stones may have minor inclusions that are visible to the naked eye. Brazilian citrine is available in abundance and often free of inclusions. However, if present, they can decrease its value. Brazilian citrine without color zoning or visible inclusions is preferred. Color zoning is frequently seen in the rough, making it a challenging task for lapidary work, as the yield of the stone gets affected significantly. For this reason, stone cutters must often make a choice between size and clarity when shaping the stone. Brazilian citrine is available in abundance, and this gem is found in virtually any cut. You will also find these gems with custom cuts, even intricate carvings! Cutters need to cut and orient the gem in a way that maximum color is shown when viewing it face up. In addition, they must make sure that the citrine is cut symmetrically with the correct to reduce windowing in the gem, which causes the gem to lose sparkle and brilliance. Brazilian citrine in large sizes is common, so the price per carat doesn’t increase dramatically for larger stones. Brazilian citrine of up to 20 carats is readily available in jewelry, making this a great choice for anyone wanting a big jewel. While some citrine occurs naturally, it’s common to produce citrine through heat treatment of smoky quartz or amethyst. The treatment is done to improve the color of the gemstone. It’s a stable treatment, and no extra care is required. Brazilian citrine measures seven on the Mohs scale of hardness, and has a good toughness, making it a durable gemstone for normal wear. However, the gemstone should be protected from shocks and scratches. Citrine can be cleaned with an ultrasonic cleaner or plain soap and water using a soft brush. Be sure to rinse and dry your jewelry thoroughly after cleaning. Steam cleaning is not recommended and should be avoided. 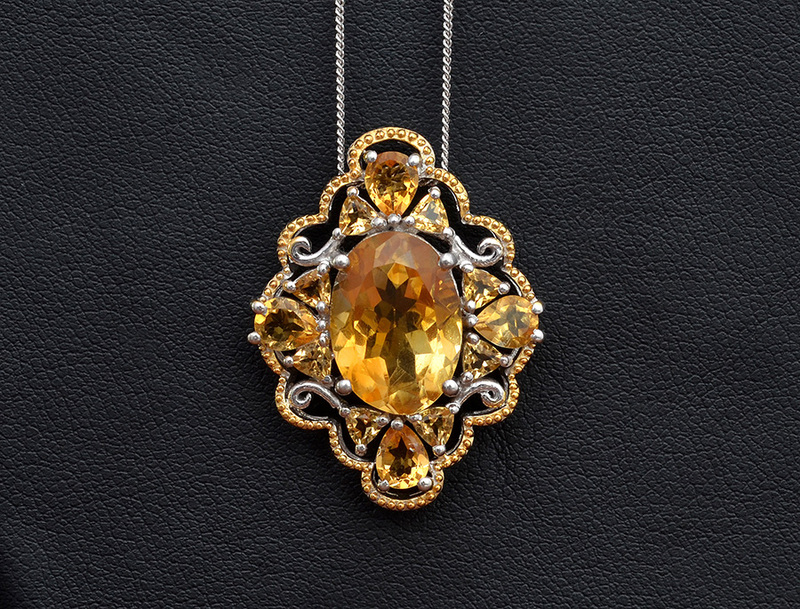 Brazilian citrine, whether treated or not, may fade if exposed to sunlight or heat for long periods of time. Therefore, you should never wear your citrine jewelry while sunbathing or when using a tanning bed. Who Can Wear Brazilian Citrine? Brazilian citrine is a popular quartz gem that captures the warm glow of autumn. The inviting tones of this gem are the perfect complement to the rich, colors of fall and winter fashions. The smooth hues of cinnamon, umber and golden yellow displays the warmth of a glowing fire. These colors make this gem an ideal accessory for the deep, saturated earth tones of fall fashion, especially colors like warm taupe, spicy mustard, and potter’s clay. These warm neutrals look best with yellow or rose gold, as does citrine! In addition, Brazilian citrine jewelry is an ideal gift choice for those celebrating their 13th wedding anniversary. How Does Brazilian Citrine Compare to Other Yellow Stones? Citrine is prized for displaying a color range of light lemon yellow to burnt orange hues, and Brazilian citrine doesn’t disappoint! 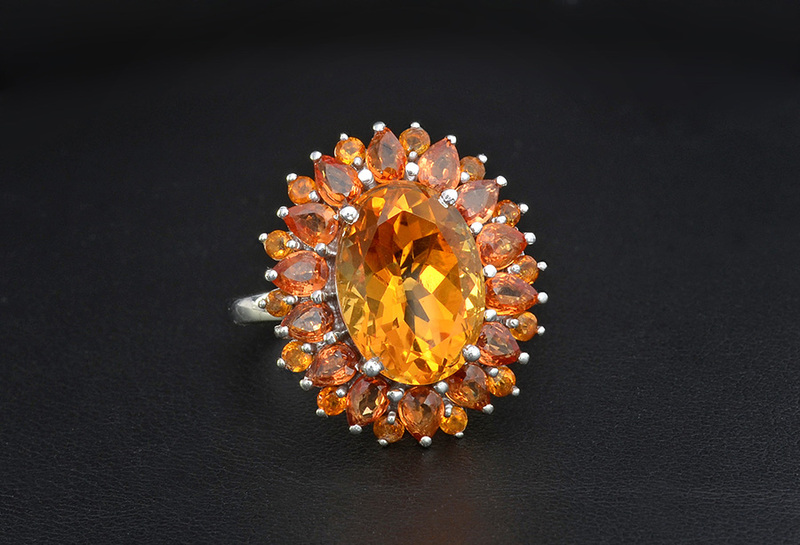 Most frequently, this gemstone draws a comparison to amber, yellow and orange topaz, as well as heliodor. Anyone who has seen a yellow and orange topaz or golden beryl will appreciate what this means. Where Does Brazilian Citrine Come From? Shop LC sources this variety of citrine from the Serra mines of Rio Grande do Sul, Brazil. Bordering Argentina and Uruguay, the Serra mines are an important supplier of raw mineral material. Other deposits of citrine are found in Bolivia, Madagascar and Sri Lanka. Currently, the largest producer of citrine is Brazil. What Does Brazilian Citrine Mean? Many therapists believe citrine as a stone that encourages fullness of life, fresh beginnings, and new pursuits. Some believe that citrine carries the power of the sun, which is why it is warm and comforting, energizing and life-giving. Other suggest that citrine enhances physical stamina and energy while encouraging proper metabolism. In addition, the gemstone is said to activate nerve impulses, strengthening intelligence and the intellectual faculties of concentration and wisdom. Is Brazilian Citrine a Birthstone? Citrine is the modern birthstone of November, along with topaz. With hues ranging from light lemon yellow to burnt orange, Brazilian citrine is a welcome addition to this list. Brazilian citrine ranks seven on the Mohs scale of hardness. Brazilian citrine displays a color range of light lemon yellow, golden yellow, yellow-brown, mandarin orange, and burnt orange. Shop LC sources the supply of Brazilian citrine from the Serra mines of Brazil. Most of the Brazilian citrine on the market is the result of heat treatment of amethyst. Brazilian citrine may also be known as Bohemian topaz, citron, Kundalini quartz, and lemon quartz.